Although I had been a pastor for a couple of years, I had little interest in theology. It was worse than that. My experience of theology was contaminated by adolescent polemics and hairsplitting apologetics. When I arrived at my university, my first impression was that the students most interested in religion were mostly interested in arguing. Theological discussions always seemed to set off a combative instinct among my peers. They left me with a sour taste. The grand and soaring realities of God and the Holy Spirit, Scripture and Jesus, salvation and creation and a holy life always seemed to get ground down into contentious, mean-spirited arguments: predestination and freewill, grace and works, Calvinism and Arminianism, liberal and conservative, supra- and infralapsarianism. The name Calvin was in particularly bad odor. I took refuge in philosophy and literature, where I was able to find companions for cultivating wonder and exploring meaning. When I entered seminary I managed to keep theology benched on the sidelines by plunging into the biblical languages. But midway through [Douglas] Steere’s lecture, theology, and Calvin along with it, bounded off the bench. A new translation of the Institutes by Ford Lewis Battles (edited by John T. McNeill) had recently been published. I knew of the work of Dr. Steere and trusted him. But Calvin? And theology? After the hour’s lecture, most (maybe all) of my stereotyped preconceptions of both Calvin and theology had been dispersed. Steere was freshly energized by the new translation. He talked at length of the graceful literary style of the writing, the soaring architectural splendor of this spiritual classic, the clarity and beauty of the thinking, the penetrating insights and comprehensive imagination. The lecture did its work in me—if Calvin was this good after four hundred years, I wanted to read his work for myself. The next day I went to a bookstore and bought the two volumes and began reading them. I read them through in a year, and when I finished I read them again. I’ve been reading them ever since. Calvin’s Institutes (5th edition, 1559) is one of the wonders of the literary world—the world, that is, of writers and writing, of digesting and arranging heaps of diverse materials, of skillful proportioning and gripping presentation; the world . . . of the Idea, the Word, and the Power. . . . 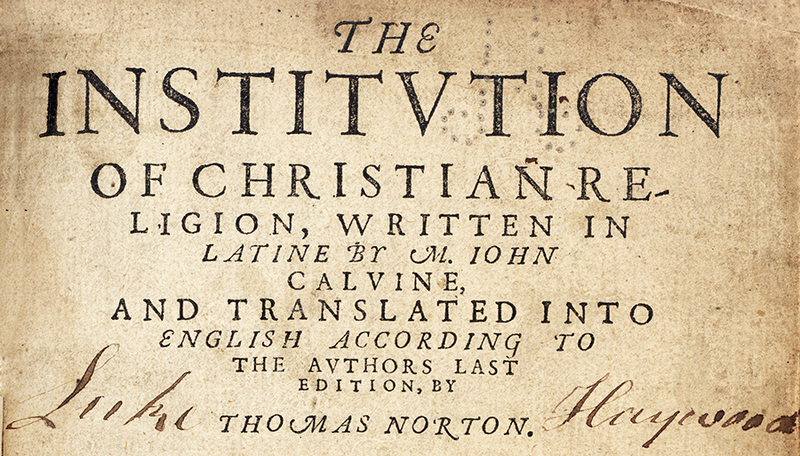 The Institutio is also one of the wonders of the spiritual world—the world of doxology and devotion, of discipleship and discipline, of Word-through-Spirit illumination and transformation of individuals, of the Christ-centered mind and the Christ-honoring heart. . . .
Calvin’s Institutio is one of the wonders of the theological world, too—that is, the world of truth, faithfulness, and coherence in the mind regarding God; of combat, regrettable but inescapable, with intellectual insufficiency and error in believers and unbelievers alike; and of vision, valuation, and vindication of God as he presents himself through his Word to our fallen and disordered minds. The readability of the Institutio, considering its size, is remarkable. Anthony N. S. Lane has written a smart and user-friendly reader’s guide to the Institutes. David Hall and Peter Lillback have edited a fine collection of essays: A Theological Guide to Calvin’s Institutes: Essays and Analysis. David Calhoun has just produced a new work borne out of years of teaching seminary students how to read Calvin: Knowing God and Ourselves: Reading Calvin’s Institutes Devotionally. For the best “biography” of the Institutes, see Bruce Gordon’s volume (which Carl Trueman calls his favorite church history book of 2016). For those who want a little more context on Calvin’s life and wider teaching on the Christian life, Bruce Gordon’s Calvin biography is widely praised, and Robert Godfrey’s John Calvin: Pilgrim and Pastor is short, accessible, and insightful. Michael Horton’s Calvin on the Christian Life is enormously helpful in orienting readers to the intersection of theology and spirituality in Calvin’s worldview. Finally, here is a schedule of reading through Calvin’s Institutes in a year.